The classic gluten free summertime salad gets instantly fancy—and extra fabulous—with a simple drizzle of balsamic vinegar reduced with dried figs. 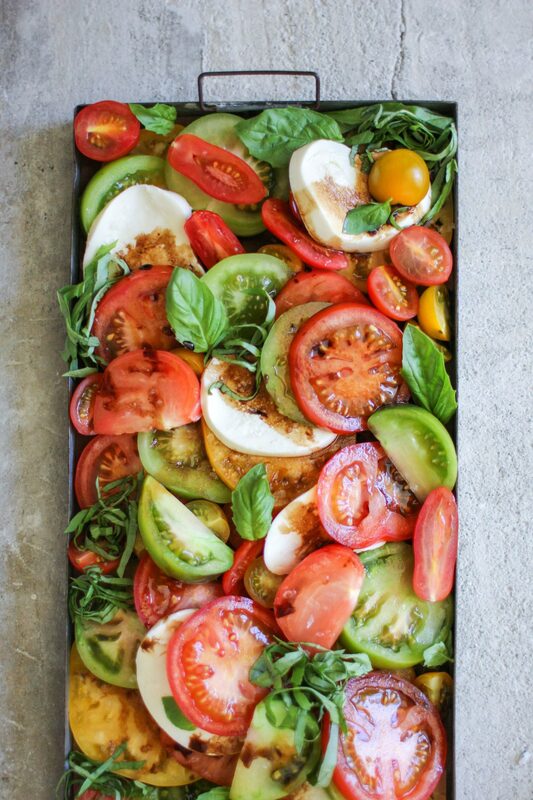 Arrange the tomato slices in a single layer on a platter. Top with the cheese. Drizzle with the olive oil and balsamic reduction, then season with salt and pepper. Garnish with the basil and serve immediately. MAKES 1/3 CUP Syrupy and seductive with intense tangy-sweet flavor, this thick sauce is magnificent with tomatoes, grilled vegetables, and chicken. It’s also an excellent ice cream topping. Store extras, airtight in the refrigerator, for up to 1 month. In a small saucepan, combine the vinegar, honey, and figs and bring to a boil over high heat. Immediately reduce the heat and simmer until the liquid has slightly thickened and reduced to about 1/3 cup, about 15 minutes. Remove from the heat and let cool. Strain the reduction through a fine-mesh sieve, pressing on the solids with the back of a spoon to extract all of the liquid. Discard the solids and serve.